Properly clean and condition all types of buoyancy compensator devices (B.C.D.) inside out with Revivex B.C.D. Cleaner. Formerly known as BC Life, this formula is also a conditioner – making it a complete maintenance system for effectively removing salt and chlorine crystals from the inside out. With each under water trip, expensive equipment is exposed to salt, chlorine and organic compounds that can damage it. 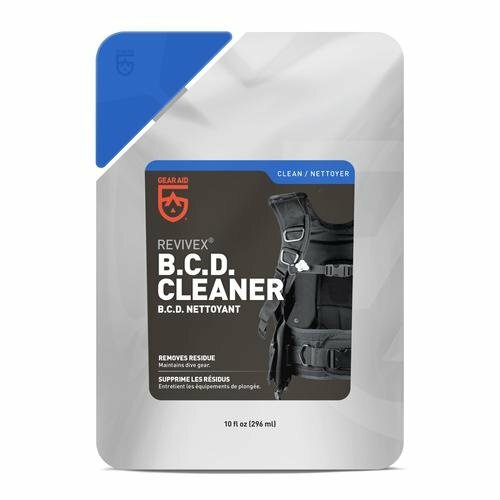 Keep your dive equipment clean and make it last longer with Revivex B.C.D. Cleaner. Gentle Cleaner – Removes salt and bacteria from inside the bladder to outside of the B.C.D. Reduces Wear – Regular cleaning and proper maintenance with this conditioner extends the life of a B.C.D.